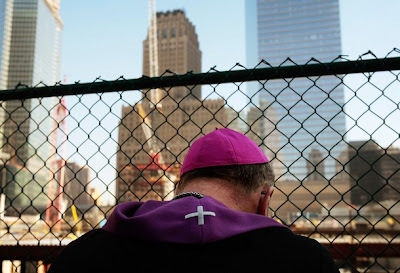 Observing his first 9/11 as archbishop of New York, Tim Dolan will celebrate a noontime Mass today at Manhattan's oldest Catholic sanctuary, St Peter's on Barclay Street, just past the edge of Ground Zero. While the spotlight's lessened a tad since his April arrival on a tidal wave of interest and goodwill, Gotham's still going ga-ga over the tenth archbishop, who spent part of the Labor Day weekend sniffing out hot dogs at a parish picnic along the far northern reaches of his 200-mile-long local church, home to 2.5 million Catholics. The day President Obama came to the White House hundreds of thousands of people gathered there. They were mainly poor people, they seemed to regard the president with a real sense of hope. DOLAN: Yes, definitely. You are correct, there is a sense of hope in the election of President Obama and in his first months. No matter how much one might disagree with the policies of President Barack Obama – and I would be one who would have disagreements – one cannot deny that he speaks eloquently of hope, and that a lot of his dreams and visions are very encouraging and challenging for the United States, and very consoling as well. He really seems sincere in wanting to be a bridge, and to bring people together, and we cannot take that away from him. I would think it is nearly impossible for us to imagine the joy and the pride of African-Americans in the election of the first African-American President. It’s so good to see how proud they are, and rightly so, to see one of their own finally in the White House. It would be similar, maybe, to us Catholics in 1960 when one of our own, John F. Kennedy, an Irish-American Catholic, was elected President. I can remember as a boy – I was only ten years old then – the exhilaration, the pride, the joy. In retrospect, as I look back now, there are many policies of President Kennedy that now I would disagree with, but I am still very proud of him and I am still very grateful for the hope, challenge, and inspiration that he gave; this is also very true with President Obama. He seems a very sincere man. When I was named Archbishop of New York, he called me, and I could tell he was very sincere. This was not some political strategy when he said to me, “I just want to tell you congratulations, and I’m praying for you and I’m asking you to pray for me”. He also said, “I know how wonderful the Catholic Church is in the Archdiocese of New York and certainly in the United States of America, and I need you very much and I pray for your leadership”. I could tell he meant it. I think some of the progress that he has made in speaking about relations with Islam, with some practical overtures for peace in the Middle East, with his desire to have an equitable and expansive healthcare network, with his attempts to fix the economy — these are promising. One might disagree sometimes with the “what” of his doing, but you can still admire the “how” he’s doing it, and I will not take that away from him. He has given a sense of hope. And in the city of New York? DOLAN: In New York, where there are many poor people, many African-Americans, and many immigrants, he gives a particular sense of excitement and promise because these people often feel on the margins, and to have someone who comes from an African-American background to now have the highest office in the land gives them a certain sense of inclusion that would be exciting in New York. New York City, of course, is traditionally the turf of the Democratic Party, so they would be happy anyway. But, all of that having been said…? Would you also say that the Church in the United States is pluralistic? DOLAN: At Mass on Sunday, where we feel united even in our diversity and the second place is . . . when I go to Yankee Stadium for a baseball game and we all sing the national anthem. Everybody’s united even if the Yankees are playing Boston! So, how can people be ‘Catholic’ and ‘Americans’? The major challenge in the history of the Catholic Church in the U.S. is how to be both a good Catholic and a patriotic American. Catholic leaders are always saying it is not only possible that one can be a good Catholic and a good American, it is natural, because American values at their core are based on natural law, faith, and Judeo-Christian morality. So, one can be a loyal American citizen and a good sincere Catholic; there should be an alliance there. That has always been the tradition or the challenge, the hope, the dream of Catholics in the U.S. But we also know that we have to decide what is of the essence of our faith, which we can never compromise, and what is not essential that we can assimilate or change to adapt to the culture. We had to adapt, we had to assimilate, we had to change some things, but that didn’t affect the essence of the faith. We must determine what’s of the essence of the faith, and what is of the non-essential, and sometimes that’s a little tricky, a little difficult. There’s an ongoing dialogue between the Church and the world. Let’s remember Paul VI’s Ecclesiam Suam. DOLAN: You are right and of course that insight of Paul VI from Ecclesiam Suam in 1964 would have been accented by John Paul II and Benedict XVI, who would say that our Catholic values do not take us away from civic responsibilities but reinforce them, so that the Catholic Church at her best affirms and strengthens what is most noble, decent, virtuous, and liberating in the human project. John Paul II said this all the time. Benedict XVI says the Church is at her best when she says “yes, yes” not “no, no”. So we say “yes” to what is best in society, we say “yes” to what is most noble and freeing and leads to dignity in human enterprise. That of course is when the Church is a light to the world, salt to the earth, leaven to the dough. And that’s what we’re called to be. Catholic American history has been very challenged in that because in the U.S. it’s not part of the culture. Back in the trenches, a key slot in the "well-oiled machine" awaits filling after Dolan named his highly-regarded Chancellor, Msgr Bill Belford, to the newly-created post of Vicar for Clergy. 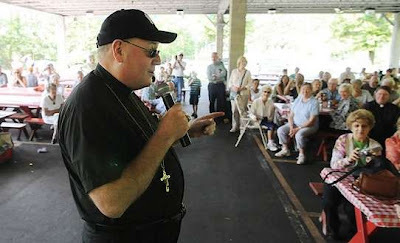 And as the retirement of the priestly generation ordained around the time of the Council looms (taking with it a sizable bite out of almost every active presbyterate), the archbishop recently extended the mandate of 44 priests still serving past the New York church's normal retirement age of 75. And fresh off a three week Spanish-immersion program in San Antonio, Dolan likewise sounded kudos for a product of his archdiocesan schools who, earlier this week, became the first-ever Latino to sit on the Supreme Court. "The Puerto Rican community rejoices with our own Justice Sonia Sotomayor," Dolan wrote in an August column. "All of us in Catholic New York should." The new justice "studied hard at Blessed Sacrament Elementary School and Cardinal Spellman High School," he said. "Her dear mother sacrificed to send her there, and her own beautiful Catholic faith gave our new Supreme Court justice the character, values and morals she holds close." The High Court's 111th justice, Sotomayor's arrival at the "Marble Palace" yields an unprecedented bloc of six Catholics on the nine-member bench. "He Loves Us To the End"